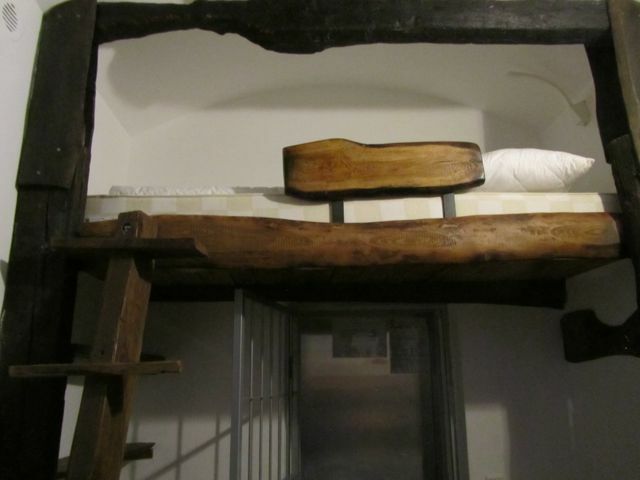 The prison (celica in Slovene) wasn’t a functioning home to thieves and murders, rather an artistic youth hostel with private rooms. Or as they were called in their day—cells. The jail, built in 1882 and attached to an army barracks, was dismantled when Slovenia won its independence from Yugoslavia in 1991. 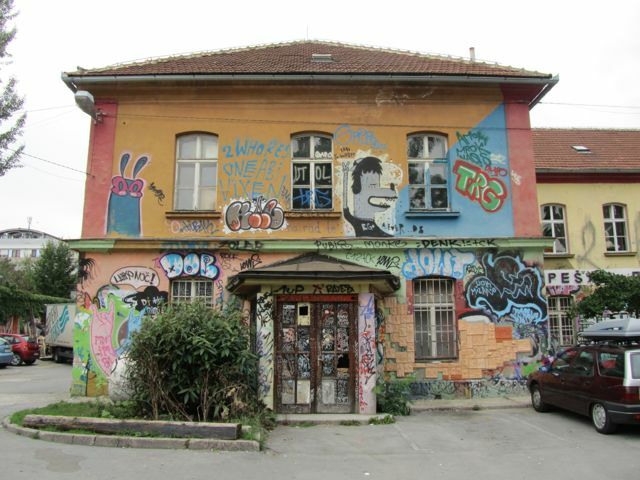 The Yugoslav army was told to leave and after a transition period came a “make peace, not war” mentality that transformed the site into a funky hostel with its own café and theater as well as adjoining galleries and artist studios. 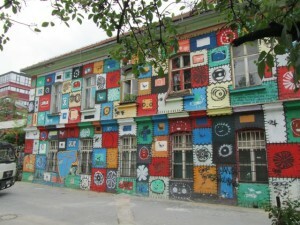 The former barracks is now wallpapered in graffiti and adorned with old tennis shoes. It was a creative solution that answered the question: what do we do with our history and the ugly Communist buildings where it took place. I applaud the concept, however, I must admit I hesitated to close my iron-barred door at night, fearing I wouldn’t be able to open it again. The experience brought home how it feels, if only briefly, to sleep behind bars…in a tiny, airtight room. The names of the last occupants were written on small plaques by the door. Their crimes? I”ll never know, even though the hallway is used as a museum of the social injustices that brought these people to the prison in the first place. Thanks to my night in jail I now have a story to tell acquaintances with my ever-expanding vocabulary in Slovene. I string nouns together to weave my tale, preferring not to venture into grammar just yet: Voda, kruh, maslo, celica, nyet kljucnih (Water, bread, butter, prison, no key) or celica, pizza buffet, wifi, basketball, nyet kljucnih (prison, pizza buffet, wifi, basketball, no key). Of course there was a key, but it’s more dramatic if I say no key, especially since I don’t have the aid of adjectives and adverbs. Locals, upon hearing my news, either think I’m super cool or completely clueless. 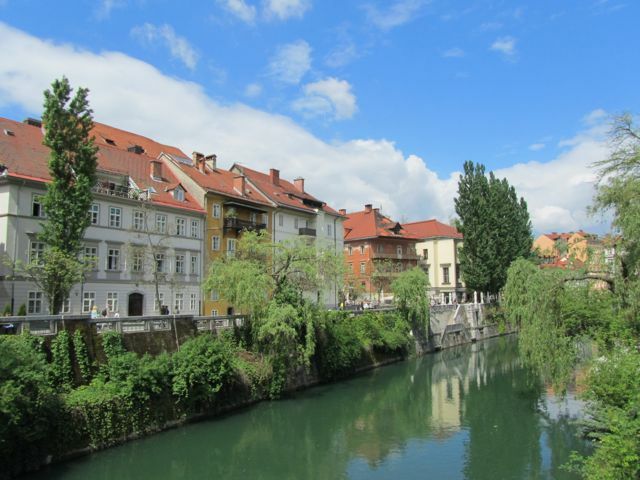 One older woman informed me that Ljubljana did indeed have nice hotels and there was no reason to sleep in a former prison. I prefer to go with the cool concept, especially after hearing that the celica was rated the coolest hostel in Europe. 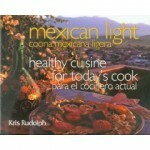 You should give it a try sometime. 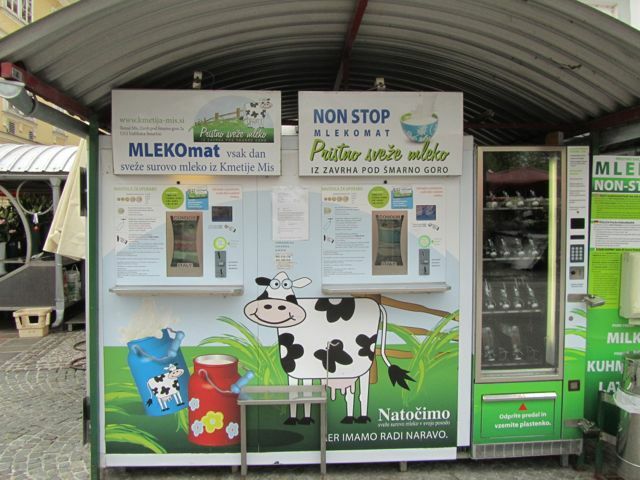 **This shot has nothing to do with prisons or youth hostels, but it’s the Milk-o-mat (or Mlekomat in Slovene) in the Ljubljana market, where people can fill up their recyclable glass bottles with fresh milk. Now that’s also pretty cool! This entry was posted on Thursday, July 10th, 2014 at 12:21 pm	and is filed under Slovenia. You can follow any responses to this entry through the RSS 2.0 feed. You can skip to the end and leave a response. Pinging is currently not allowed.